MINOX MD 50 W 16x-30x Spotting Scope w/ Free Shipping! 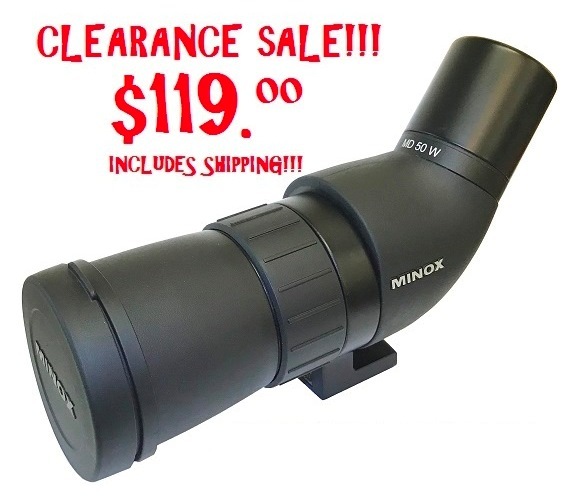 !, Treasure Chest | New England Custom Gun Service, Ltd.
MINOX MD 50 W 16x-30x Spotting Scope w/ Free Shipping!! CLEARANCE SALE : MINOX MD 50 W with Fixed 16x - 30x Angled Ocular. Compact spotting scope with lens covers. Accepts standard tripod attachments. 24 ozs. $119.00 PRICE INCLUDES GROUND SHIPPING TO U.S. ADDRESSES ONLY.